Stretch marks occur when your body grows faster than what your skin’s collagen can handle. Your skin is made of collagen and elastin proteins that can only stretch so far before they break. Once you exceed the limit that they can stretch, the proteins will break – and they leave evidence behind in the form of a stretch mark. Stretch marks are a problem for both bodybuilders and pregnant women. It’s common to get stretch marks during pregnancy, rapid weight gain, obesity, and when body building. Pregnancy is a time when new skin and tissues are being added rapidly. When someone gains weight rapidly or is obese, there’s an overload on the skin and the tissues. When someone is bodybuilding, there’s a much higher demand on the muscle and skin proteins to grow. All these conditions cause the elastic fibers just under the surface of the skin to break, resulting in stretch marks. But not all pregnant women and bodybuilders get stretch marks. 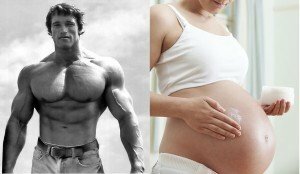 Yes, this one of the few articles written for both pregnant women and bodybuilders. Part of the stretch marks puzzle is that the type of skin you have and your genetics play a role in how easily you develop stretch marks. The thinner your skin, the more susceptible it is to break. The less elasticity you have in your skin, the more easily you’ll develop stretch marks. Rest your right hand naturally on a desk. With your left forefinger and thumb, squeeze the skin covering your hand together, pulling it upwards. Hold in this position for 3 seconds. Let the skin snap back in place. Count the seconds it takes to return to normal. The longer it takes, the worse your skin elasticity. An ounce of prevention is always worth more than trying to deal with a situation afterward. This is truly the case with ugly stretch marks. Many will attest that if they had only done something to prevent them from occurring, it would have been much easier than trying to get rid of them. So, if you’re reading this in time then make sure you follow these tips! Hydrolyzed Collagen. Collagen formation is essential to improving your skin’s elasticity. Besides eating a high protein diet (fish, chicken, beef, buffalo, lamb, turkey, eggs, etc. ), supplement your diet with collagen broth and a collagen peptide powder. Hydrolyzed collagen supplements are proven to boost healthy collagen in your skin and reduce wrinkle depth. Although there haven’t been many studies on the effect of collagen supplements in preventing stretch marks, all indications show that this is one of the most powerful supplements you can take for overall skin health. Drink plenty of water. This is so important because blood volume doubles by the 7th month of pregnancy and your body is demanding water. Drink at least 2 liters of water each day if you’re pregnant. Whenever you notice you have dry lips, drink water. Don’t even think about it. Rub in good fats topically. Apply coconut oil, shea butter or cocoa butter daily to your belly, breasts, thighs and buttocks. These oils/butters support the cell membranes of the skin which absolutely need good fats for their structure to be sound. Increase your vitamin C intake. Vitamin C helps in the formation of collagen in your skin. It’s always better to increase your vitamin C intake from foods rather than supplements, so you get the natural forms of vitamin C that the human body has been using for millennia. The foods highest include oranges, red peppers, green peppers, apples, and grapefruit. Take fish oils daily. Fish oils are loaded with omega 3 fatty acids you need for healthy skin and also for your baby’s brain development. If you’re a bodybuilding, these fatty acids are also important in the formation of natural testosterone and other bodily functions. Take the correct amount of zinc. Zinc deficiency causes stretch marks. Try to get all your zinc from food, but go farther and ask your doctor to order a serum zinc level to see what your status really is. If you’re deficient, you’ll need anywhere from 50 to 100 mg daily to replenish the stores – ask your clinical nutritionist or doctor. Zinc is essential for healthy skin and formation of collagen, and it’s found in the dark meat of chicken, dark meat of turkey, and beef. Other foods (except oysters) are really not that high in this mineral. What Can You Do To Get Rid of Stretch Marks If You Already Them? 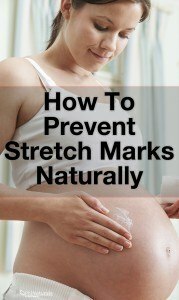 If you already have bad stretch marks, don’t worry. There is a solution. Miraculously, cosmetic dermatologists have discovered that a certain type of laser used on the skin will literally erase the stretch marks after a few sessions. Check out this video to see this new development for removing stretch marks. When you get pregnant, there’s so much to do. You have to think of a name, create a baby room, tell everyone, eat right, continue to exercise, and get enough rest. Don’t forget to add your stretch marks prevention routine to the list of things to do! Get started on the hydration, the nourishment and the lubrication. You’ll be so glad you did!